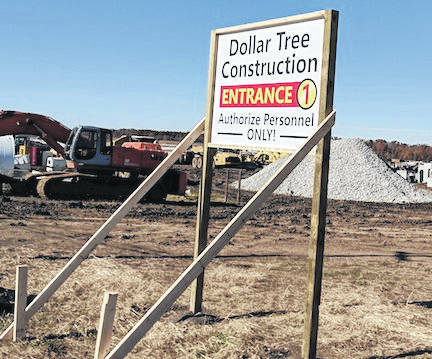 Construction has been underway all fall for the Dollar Tree Distribution Center on SR61 at I-71. The county and ODOT are planning to widen the road and create three more lanes at the site. MOUNT GILEAD — Morrow County Commissioners met Wednesday with officials from the Ohio Department of Transportation and Columbus 20/20, the economic development organization for the region. The purpose of the meeting was to review options for financing the construction of additional lanes and widening of the road on SR 61 and I-71 by the Dollar Tree Distribution Center now under construction. Present plans call for the construction of a new left turn lane going north on SR 61. Additionally, going south on SR61, a right turn lane will be positioned directly across from Bennington Glen headed north on SR 61. A second right turn lane will be at the intersection of SR 61 headed west on Cardinal Drive. This new roadwork will include pavement repairs, asphalt surfacing and widening of SR61. At the beginning of the meeting, Commissioner Tom Whiston stated the commissioners’ concern about the agreement signed by former Economic Development Director Shane Farnsworth. It states that Morrow County will finance $308,000 in addition to the $250,000 from the county’s ODOT Transportation Improvement District (TID) funding. “We didn’t approve the money,” Whiston said, referring to the commissioners. He added that the agreement was made by Farnsworth without the commissioners’ knowledge or approval. Whiston acknowledged that there is a need to take care of the additional traffic at the location of the Dollar Tree site. The county does not have funds available for the road project in its budget. Justin Bickle, Director of Project Management for Columbus 20/20, said that Morrow County got the most comprehensive package for the project that is possible. 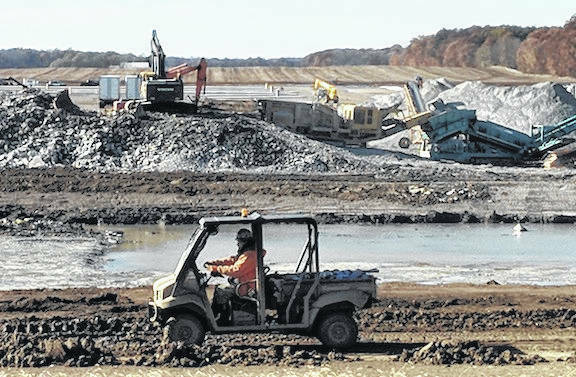 Of this $2,280,495 project, the grants from the state cannot exceed 75 percent of the cost of the project. At this point the state has slated $1,222,000 as a Roadwork Development DSA629 grant. ODOT’s portion is at $250,000. $250,000 is estimated for Morrow County with the additional $308,000 in the agreement signed by Farnsworth. ODOT Regional Manager Eddie King noted that there is always a local portion. In this project the state gave considerably more than the usual percent due to the size of the Dollar Tree project. Bickle recommended that a JEDD solution may be viable for this project. The JEDD (Joint Economic Development Districts) provide a process where municipalities and township can cooperate to foster development activities. The village of Marengo and Bennington Township could work in cooperation to help the funding of the $308,000, for which there would be reimbursement. Commissioners Burgess Castle and Warren Davis also said they were not informed of the agreement. After the commissioners stated that they did not have the money to fund the project, Bickle said it is important to explore using the JEDD funding as preparation for the future. There may also be other options to look into for the gap in funding. Bickle said it is essential to have an agreement to go to Mike Mullis, who is negotiating for the Dollar Tree Corporation. Morrow County’s new Economic Development Director Andy Ware said that all parties will be looking at options to make sure the project goes forward. Ware said that the forecast to have Dollar Tree open and in operation is going forward as planned. He anticipates the work to be completed in the summer of 2019. Whiston said the Dollar Tree Distribution Center is projected to provide 400 new jobs to Morrow County that will pay good wages with benefits. The building is estimated to be 1.2 million square feet (about 27.5 acres) at a cost of about $125 million.